Screen Wall is the ideal solution for a durable, weather resistant porch. Create Posts, Rails & Other Elements - With Screen Wall, you can create a nice, clean look with or without an existing porch structure. 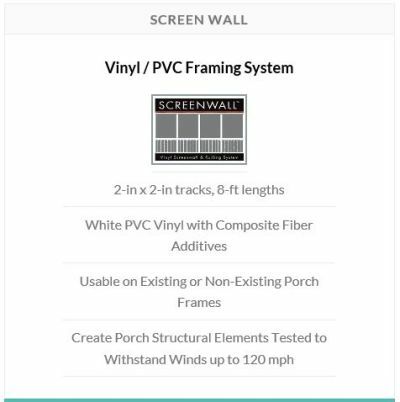 Easy Installation - This unique reinforced PVC vinyl framing system allows you to screen from the interior or exterior of your porch using flat spline, in less time. Tested for Weight & Weather Resistance - The PVC vinyl with composite fiber additives enables Screen Wall to resist extreme wind and weather. Unlimited Screening Configurations - Screen Wall can either attach to existing porch structure or be used to create porch structure elements. Hidden Fasteners for a Clean Look - Screen Wall creates a seamless appearance with it’s 100% hidden fasteners. Modular Screen Porch framing system made of ridid PVC vinyl and composite fiber additives to withstand extreme wind and weather.